The bestselling author of The Art Forger and The Muralist delivers a page-turning historical thriller of art and revenge, of history and love, that will transport readers to 1920s Paris and America. It’s the summer of 1922, and nineteen-year-old Paulien Mertens finds herself in Paris—broke, disowned, and completely alone. Everyone in Belgium, including her own family, believes she stole millions in a sophisticated con game perpetrated by her then-fiancé, George Everard. To protect herself from the law and the wrath of those who lost everything, she creates a new identity, a Frenchwoman named Vivienne Gregsby, and sets out to recover her father’s art collection, prove her innocence—and exact revenge on George. When the eccentric and wealthy American art collector Edwin Bradley offers Vivienne the perfect job, she is soon caught up in the Parisian world of post-Impressionists and expatriates—including Gertrude Stein and Henri Matisse, with whom Vivienne becomes romantically entwined. As she travels between Paris and Philadelphia, where Bradley is building an art museum, her life becomes even more complicated: George returns with unclear motives . . . and then Vivienne is arrested for Bradley’s murder. B. A. Shapiro has made the historical art thriller her own. 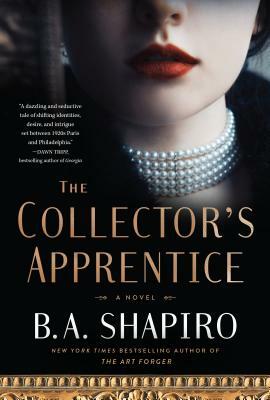 In The Collector’s Apprentice, she gives us an unforgettable tale about the lengths to which people will go for their obsession, whether it be art, money, love, or vengeance. B. A. Shapiro is the New York Times bestselling author of The Muralist and The Art Forger, which won the New England Book Award for Fiction and the Boston Authors Society Award for Fiction, among other honors. Her books have been selected as community reads in numerous cities and translated throughout the world. Before becoming a novelist, she taught sociology at Tufts University and creative writing at Northeastern University. She and her husband, Dan, divide their time between Boston and Florida.